The acquisition of West Australian regional carrier Skywest by Virgin Australia has cleared its final hurdle with High Court of the Republic of Singapore giving its blessing paving the way for Virgin Australia to increase competition to regional Australia and enter the resources charter market. The Skywest transaction is part of three equity announcements made by Virgin Australia on 30-Oct-2012 that also included the acquisition of a 60% stake in low-cost carrier Tiger Australia and the sale of a 10% stake in Virgin Australia to codeshare partner Singapore Airlines. Only the Tiger Australia transaction remains outstanding, with the ACCC extending its deliberations beyond the original Mar-2013 deadline and a decision now not expected until May-2013. The deals are designed to allow Virgin Australia to compete better with Qantas on all domestic fronts by gaining access to the regional network and the fly-in-fly-out (FIFO) charter markets. In addition Tiger Australia provides a ready-made option to re-enter the LCC market that Virgin Australia evolved away from as the carrier moved up-market to compete with Qantas for the lucrative corporate and government markets. The Skywest acquisition also gives Virgin Australia direct operational control of the ATR 72-500 and -600 fleet that already flies under its colours on regional routes on the east coast of Australia as well as fast tracking growth in the fly-in-fly-out (FIFO) mining charter sector, expanding its regional network and entering the corporate charter market. The two carriers entered into a 10-year strategic alliance, the Australian Regional Airline Network (ARAN) agreement signed in Jan-2011. Under the agreement Skywest acquired and operates the ATR fleet on a wet lease basis for Virgin Australia. All of Skywest’s operations will be rebranded as Virgin Australia although the carrier will continue to operate under its current Air Operator’s Certificate (AOC). Virgin Australia has said it will conduct a review of Skywest’s operations with a view to aligning the operation with its own. The airline does not have any immediate plans to make major changes to Skywest’s business or dispose of or redeploy its assets. The takeover deal was earlier approved by the Australian Competition and Consumer Commission, the Securities and Industries Council of Singapore and shareholders. Skywest was majority Australian owned but incorporated in Singapore and dual listed on the Australian Stock Exchange (ASX) and the London Stock Exchange (AIM). The shares ceased trading on the both exchanges on 27-Mar-2013 following the High Court of the Republic of Singapore sanctioning the deal the day before. Under the deal, Virgin Australia will offer Skywest shareholders AUD0.45 per share (USD0.46) with AUD0.225 (USD0.223) per share to be paid in cash and 0.53 new Virgin Australia shares for every Skywest Airlines share. Skywest reported a SGD2.2 million (USD1.8 million) loss for the six months to 31-Dec-2012, down from a SGD4.5 million (USD3.6 million) profit for the same period in 2011. The carrier said substantial investment and expansion of the workforce undertaken in preparation for future growth of the ARAN network, combined with changing market conditions led to the loss for the half year. During the period Skywest also increased capacity on its regular public transport (RPT) network ahead of it being deployed on new FIFO contracts with BHP Billiton Iron Ore and Rio Tinto which were announced in Oct and Dec-2012. In the FIFO charter business, capacity (as measured by ASKs) was 18% lower than the same period last year while revenue was down 6% reflecting higher unit revenue. FIFO operations had recovered to record levels by Mar-2013. Charter revenue of SGD54.3 million (USD52.4 million) was down 6.2%, while passenger revenue was 4.2% lower at SGD54.3 million (USD43.9 million). Skywest faced a reduction in its monopoly routes during the first half of FY2013 as a result of deregulation and increased security requirements which cost the carrier some RPT revenue at some airports. However, charters to Onslow, a coastal town about 1,400km north of Perth in the Pilbara region, were growing rapidly. The ARAN operation also reached 1,906 block hours in Jan-2013, more than double the 833 block hours recorded in Jan-2012. The second half of FY2013 had started off strongly with trading in Jan-2013 materially better than Jan-2012, the carrier said. An on-going review of business has also led to considerable cost savings in recent months which should result in an improved financial performance in the second half, according to Skywest. Skywest says the aircraft charter market is a thriving segment for the aviation industry with significant growth opportunities for the carrier, particularly in Western Australia, where the enormous mining and resources sector accounts for about 60% of the state’s total exports. The airline operates regular contract charter services for Rio Tinto, BHP Billiton and Chevron/Bechtel. The charter business is expected to continue expanding as demand from the resources sector continues to increase. This expansion is, however, also attracting the interest of competitors in both the RPT and charter businesses. More than AUD180 billion in resource projects are planned or underway in Western Australia with many of those requiring charter flights to fly staff into and out of their remote locations. Existing charter contracts were also being expanded as many resource projects move from planning/exploration to construction and production phases, according to Skywest. The transactions reinforce Virgin Australia’s strategy of picking its partners according to its own specific needs. The group has already expanded its international network through partnerships with Etihad, Singapore Airlines, Delta Air Lines and Air New Zealand. The carrier transports about 800,000 passengers a year on its own network (excluding the ARAN joint venture in Queensland) throughout Western Australia as well as to Darwin, Melbourne and internationally to Denpasar on the Indonesian island of Bali (substantial numbers of FIFO employees actually live in Bali, flying to and from home there on their frequent leave periods). Charter and FIFO operations account for about 500,000 of the total number of passengers carried each year and the remaining 300,000 travel on RPT services. The airline’s three biggest routes are in southwest Australia, led by Perth to the gold mining town of Kalgoorlie which is also linked to Melbourne. A significant part of Virgin Australia's strategy is to ensure it is able to cover most of the valuable routes that main competitor Qantas Group flies. 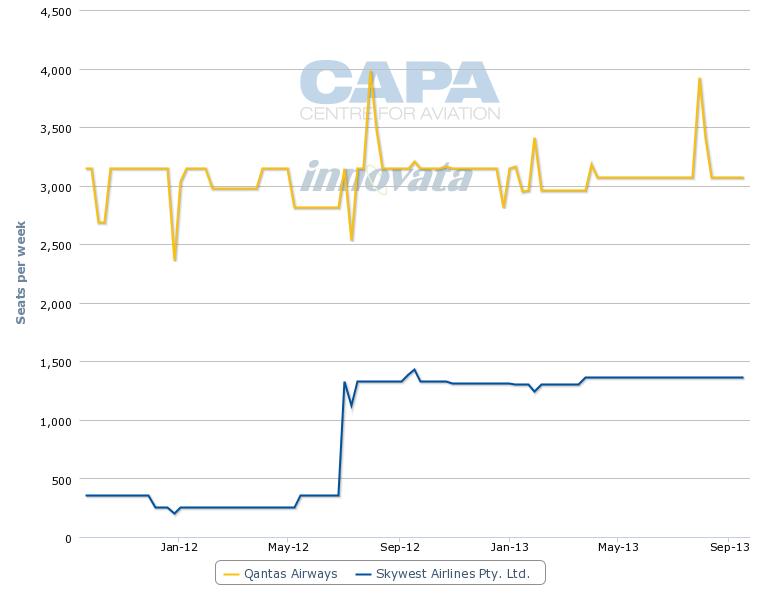 Skywest competes with Qantas on Perth-Kalgoorlie as well as on Perth-Geraldton, Perth Learmonth. The carrier has a monopoly on Perth-Albany, Perth-Esperance, and Perth-Derby but competes with independent regional carrier, Airnorth on Broome-Kununurra and Kununurra-Darwin. Skywest and Virgin Australia together also compete with Qantas on Perth-Broome and Perth-Busselton. Skywest currently operates a fleet of 30 aircraft consisting of one A320, Fokker F28s, Fokker F27s and ATR72s. Skywest took delivery of its 11th ATR72 aircraft on 02-Mar-2013, taking the fleet of the ATR fleet to 11, all operating on the East Coast of Australia. 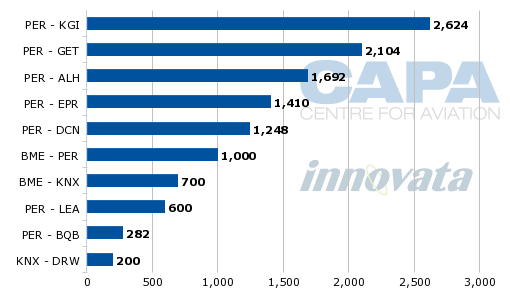 The total fleet is expected to reach 33 aircraft by 30-Jun-2013, with the arrival of a second A320 and a 12th ATR. The carrier is also considering the acquisition of two additional A320s. Skywest’s average fleet age is in excess of 20 years, excluding the ATR fleet, presenting a clear opportunity for Virgin Australia to reduce costs and improve efficiency despite its stated position that it has no immediate plans to dispose of or redeploy Skywest’s fleet. In contrast, Virgin Australia’s regional jet fleet of ERJ190s has an average age of 4.2 years. Skywest owns its fleet of eight Fokker F27s and one of its 10 in service Fokker F28s accounting for 30% of the total fleet. 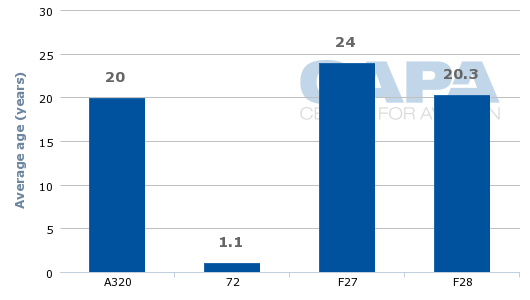 The remaining 70% of the fleet, including the A320 and ATRs, is leased. Skywest offers Virgin Australia the opportunity to expand its existing Western Australia regional network, although Skywest’s scheduled service capacity of about 13,700 seats, barely registers in the national system. The real value in the acquisition is the ready-made access Virgin gains to the growth opportunities in the resources sector, much of it on contract, subject to competitive tender.